The β-barrel assembly machinery (BAM) is involved in folding and insertion of outer membrane proteins in Gram-negative bacteria, a process that is still poorly understood. With its 790 residues, BamA presents a challenge to current NMR methods. 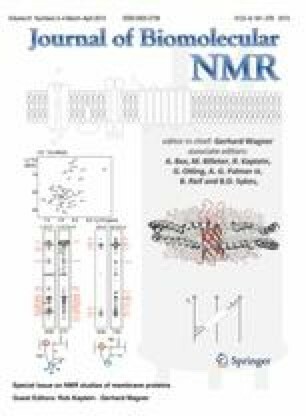 We utilized a “divide and conquer” approach in which we first obtained resonance assignments for BamA’s periplasmic POTRA domains 4 and 5 by solution NMR. Comparison of these assignments to solid-state NMR (ssNMR) data obtained on two BamA constructs including the transmembrane domain and one or two soluble POTRA domains suggested that the fold of POTRA domain 5 critically depends on the interface with POTRA 4. Using specific labeling schemes we furthermore obtained ssNMR resonance assignments for residues in the extracellular loop 6 that is known to be crucial for BamA-mediated substrate folding and insertion. Taken together, our data provide novel insights into the conformational stability of membrane-embedded, non-crystalline BamA. The online version of this article (doi: 10.1007/s10858-014-9891-6) contains supplementary material, which is available to authorized users. We thank Mark Daniels and Johan van der Zwan for excellent technical support. Scientific discussions with Dr. Markus Weingarth and Prof. Jan Tommassen are gratefully acknowledged. This work was funded by the Netherlands Organization for Scientific Research (NWO) (Grants 700.26.121 and 700.10.443 to M.B. ).